Almost all the recordings by this hot gaspipe style clarinetist (the balance are available on BDW8025) including four unissued test pressings, one of which is not even listed in “Rust”. Personnel includes Jelly Roll Morton, Henry “Red” Allen, Eddie Lang, Lonnie Johnson and Johnny St. Cyr. Wilton Crawley (clt,v) acc. by Eddie Heywood, Sr. (p), Eddie Lang (g), John Truehart (bjo). Wilton Crawley (clt,v) acc. by unknown (p), Lonnie Johnson (g), probably Johnny St. Cyr (bjo). Wilton Crawley (clt,v) acc. by Eddie Heywood, Sr. (p), Eddie Lang (g). Wilton Crawley (clt,v) acc. by Henry Allen (t), Charlie Holmes (as), unknown (ts), Luis Russell (p), Will Johnson (g), George “Pops” Foster (sb), Paul Barbarin (d). Two unknown (one of whom may be Henry Allen) (t), unknown (tb), Wilton Crawley (clt), Charlie Holmes (as), Jelly Roll Morton-Luis Russell (p), unknown (g,bjo), George “Pops” Foster (sb), ?Sonny Greer (d). Henry Allen (t), Wilton Crawley (clt,v), Charlie Holmes (as), Jelly Roll Morton (p), Teddy Bunn (g), George “Pops” Foster (sb), Bruce Johnson (wb). 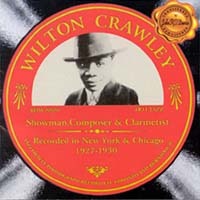 Note: Victor 23344 is credited to Wilton Crawley and The Washboard Rhythm Kings.